CAKE has two methods of tracking In App Advertising, by use of the UDID Parameter or Session Regeneration. The processes below will walk you through the scenario where the consumer is in an application and clicks on an advertisement. In App Advertising allows an Affiliate to extract a unique value from the consumer's phone, the value itself will depend on the user's type of device. One example of a Unique Device Identifier is the IDFA. The unique device ID should be passed in the UDID parameter of the CAKE Unique Link as displayed above. *For information on the best ID to use in this UDID field please see our Best Practices documentation here. The UDID can be passed onto the query string by using the #udid# token in the Offer link or Creative Offer link within CAKE. This token can also be found under the Setup maintab > Show Tokens card. Finally, CAKE will look to match the UDID value passed on the click to the UDID value received later on the postback url, that will record the conversion/install. Note: A major benefit of utilizing the UDID parameter on the tracking link and conversion/install pixel is that there is no lookback window or lifespan as there is on Session Regeneration. An alternate method of tracking mobile application installs is the use of the Session Regeneration tool found on the Offer card > Attribution tab. Note: The encouraged method is the use of the UDID parameter. 1. Session Regeneration Seconds: This is the "window of opportunity" where a Conversion/Install can be tracked. This "window" is from the moment a consumer clicks the CAKE Unique Link to the time the Application is first opened on their device where the Conversion/Install Postback is sent to CAKE. Today, the maximum time CAKE will track this installation is 86,400 seconds, or 24 hours based off of IP Session Regeneration or 30 days for Sub ID Session Regeneration types. 2. Session Regeneration Type: This defines the unique tracking key that will be used on the Unique Link and the Postback URL. Note: Some Session Regeneration Types are recommended for app tracking where others are not. IP Only: Selecting IP Only will limit CAKE to track application installs based on the IP of the click and the IP passed on the Postback URL. If the IP on the click does not match the IP passed in the IP parameter of the Postback URL, within the Session Regeneration seconds, a Conversion/Install will not be tracked. IP + User Agent: CAKE must match the IP Address and the User Agent of the click to the Postback URL. The User Agent is the unique thumb print of the consumer's device which includes OS, Browser and more. Note: This type is not recommended as the User Agent in the mobile browser is not the same as the User Agent from the App. IP + Sub ID: CAKE must match the IP Address of the click and on the Postback URL. In addition, a unique tracking key must be passed in on Sub ID 2, 3, 4, or 5 and must be passed back into CAKE in the UDID parameter of the Postback URL. CAKE will only track a Conversion if both the IP and Sub ID value match. Sub ID only: CAKE ignores the IP Address of the consumer's phone and only looks at a unique tracking key being passed in on the click in either the Sub ID 2, 3, 4 or 5 parameter and then returned on the Postback URL in the UDID parameter. Sub ID 5 Only Fallback to IP + Device: CAKE will attempt to track a Conversion based on a unique tracking key being passed in on the s5 parameter of the Unique Link. If CAKE is UNABLE to track based on s5 value, it will attempt to match the IP Address and the Device of the click with the IP Address passed in the IP parameter of the Postback URL and the Device. Sub ID 5 Only Fallback to IP + Device Fallback to IP Only: The most permissive tracking type, CAKE checks first for a match against values in the s5 and UDID parameters passed, if it can't match it checks for a match against the IP plus the Device and if that fails to match it checks purely against IP. CAKE will track the conversion/install of the mobile application when the application opens for the first time, either through use of the SDK or a server call made by the Advertiser or another 3rd Party. Contrary to traditional server tracking in CAKE, the Postback URL for Mobile Application Installs will include the udid= parameter for passing the unique device id or for session regeneration values, as opposed to a r= parameter on a traditional server call. Additionally, the Postback URL will need to include f=mpb in order to respond to the server or application with an XML response. The first postback url above reflects the format of a conversion/install pixel when the UDID parameter is utilized. The second postback url reflects the format of a conversion/install pixel when Session Regeneration is utilized. Below is a complete list of parameters that can be used on a Postback URL for Mobile Application Install Offers. o= This is the Offer ID. In the example above, o=1 which is referring to Offer ID 1 in your system. f= This is the format of the Pixel, pb will tell CAKE that the pixel is a postback and the response should be XML. t= This is an optional parameter that allows the Advertiser to pass a unique ID per Conversion. This is often an Order ID that allows you to reconcile reports against theirs. ip= This parameter allows you to pass the IP Address of the user that installed the Application. This IP Address should match that of the click when Session Regeneration is used. If the App itself is calling the Postback URL, there is no need to append the IP to the Postback URL. 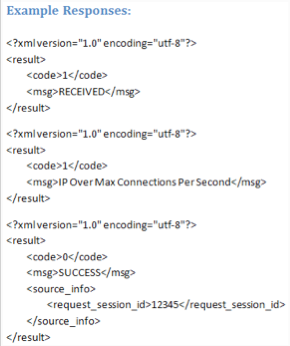 The above screenshot is an example of the XML response after a Postback URL call to CAKE is processed. Note: The unique Request Session ID in the response can be used for subsequent Event tracking after the application conversion/install. CAKE is also able to track Application Installs from a user who clicks on an Advertisement outside of the Application. These advertisements could be an email loaded on their device or a banner dispayed in their mobile browser. The Affiliate will be issued a standard CAKE Unique Link to track the consumer and to redirect them to the store where they will download the Application. The Affiliate can place optional tracking parameters, such as a the Sub Affiliate ID and other Sub ID parameters. Unlike, In-App Advertising, the only device identifying value that CAKE can use when a user clicks on an Advertisement outside of an Application is the IP Address. As mentioned previously, In-App Advertising allows the use of values such as the IDFA or Mac Address to track conversion/installs. With that said, the Affiliate does not need to customize their Unique Link to accomodate the IP Address as CAKE will track this naturally. 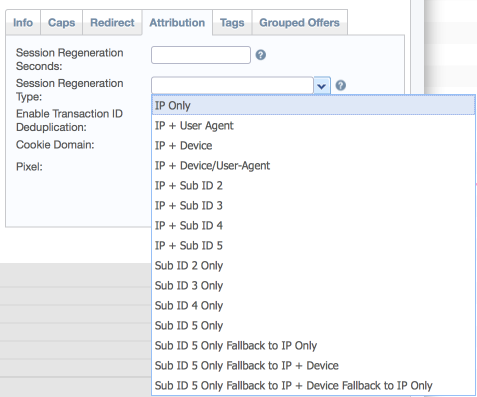 Since Out of App Advertising relies on IP Address, the Offer setup in CAKE will require the use of Session Regeneration. This feature can be found under the Attribution tab on the Offer card. 1. Session Regeneration Seconds: This is the window of opportunity wherein a conversion/install can be tracked. This window is from the moment a consumer clicks the CAKE Unique Link to the moment the Application is opened on their phone. Today, the maximum window CAKE will track this installation is 86,400 seconds (24 hours) based off of IP Session Regeneration. 2. Session Regeneration Type: This defines the unique tracking key that CAKE will track a Conversion, in this case, IP Only will be supported. Once the consumer opens the Application, the Application or Advertiser will make a server call to CAKE by way of the Postback URL. The IP Address of the user's device will need to be passed back on the Postback URL, unless the Application is making the call itself. In this case, the postback url will carry the IP Address of the user's device naturally. If CAKE matches the IP Address on the Postback URL to the IP Address on the original click, within the Session Regeneration time frame, a conversion/install will be stored. When the UDID Mobile App tracking method is used, the unique device id value will be displayed in multiple CAKE reports for reference. The UDID will be displayed on the Conversion card, Event card and Lead card (Sale Info tab). 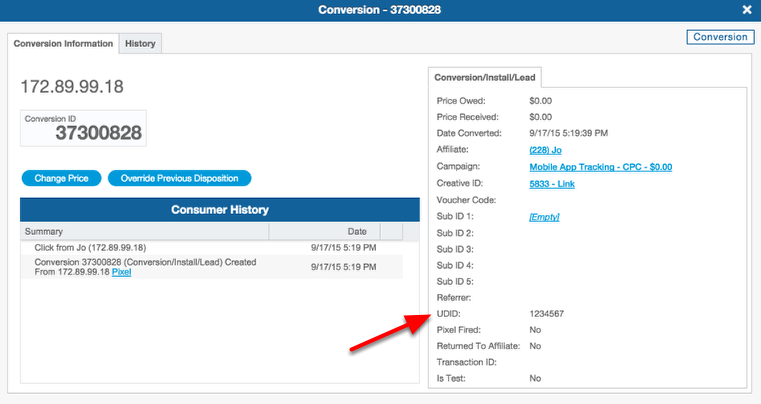 A UDID column will be available in all Click and Conversion reports, including the Testing sub tab and Affiliate Portal Reports. *Affiliate Portal reports are only customizable by Admin user's but span across all Affiliates, not just the Affiliate portal the view was edited in.